WMW John Cooper Works Brake Rotors For 2002-2006 R50 MINI Cooper, R53 MINI Cooper S, and All 2005-2008 R52 MINI Cooper and Cooper S convertible with JCW brake kit. 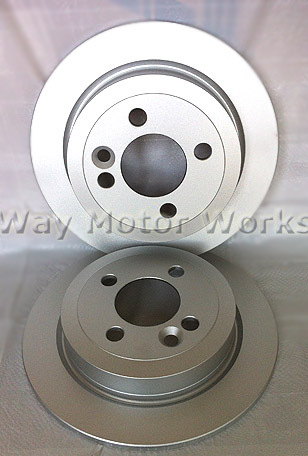 These brake rotors are Manufactured from high carbon steel. 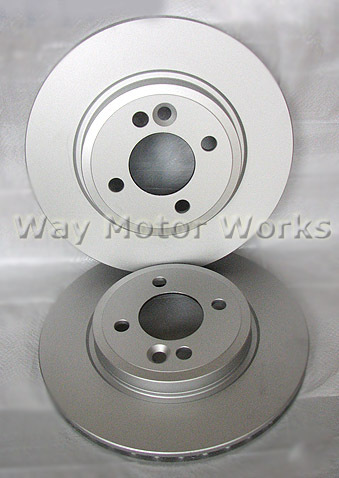 They are extremely high quality OEM replacement rotors, or OEM copies. Pretty much the same performance as the stock ones, but a little easier on the pocket book. We pretty much use these on all brake jobs at the shop. These smooth face rotors are quiet and super durable. They all come coated to keep them from rusting like cheap rotors. Sold as a pair per axle or set of 4. Again these JCW WMW brake rotors are ONLY for R50 R52 R53 MINI's that have the John Cooper Works Brake package with red calibers installed on the front.